Was the Colorado Primary Rigged for Ted Cruz? Subject: Was the Colorado Primary Rigged for Ted Cruz? Texas Sen. Ted Cruz swept up all 34 of Colorado's Republican delegates this weekend. GOP front-runner Donald Trump won zero. 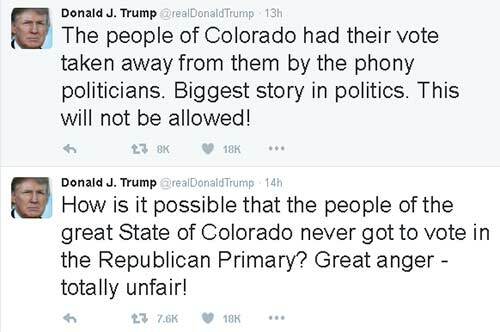 Trump angrily took to Twitter yesterday, where he claimed the people of the Centennial State were robbed of a proper Colorado primary — and he's right. Colorado's primary election process is a controversial one. You see, on Aug. 25, 2015, the state's GOP executive committee voted to cancel the traditional presidential primary poll after the national party changed its rules to require a state's delegates to support the candidate that wins the caucus vote. Thus, Colorado became one of six states or territories (alongside American Samoa, Guam, North Dakota, Wyoming, and the Virgin Islands) to forego primary voting altogether. That's right, everyday Coloradans don't get to cast primary votes. Instead, the state holds its own Republican convention. This convention is referred to as a "delegate caucus." And it was at this weekend's Colorado delegate caucus that Centennial State GOPers determined who among them will make up the 34 delegates headed to the Republican National Convention in July… all of whom are now pledged to Ted Cruz. Many mainstream media sources have pointed out that the Texas senator did campaign intensely in the state, whereas Trump did not. Cruz made several speeches and appearances in Colorado over the last month. By comparison, Trump's campaign didn't even put a visible paid staffer on the ground until last week, reported The Denver Post yesterday. Regardless of the state's new process, it was this shady revelation that strongly implies a rigged Colorado primary in favor of Ted Cruz. 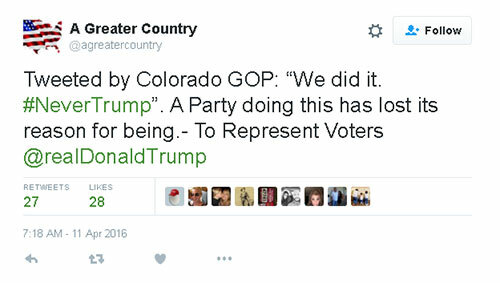 Just moments after announcing that Ted Cruz had swept all 34 delegate slots at the Colorado GOP convention Saturday, the state party tweeted: "We did it. 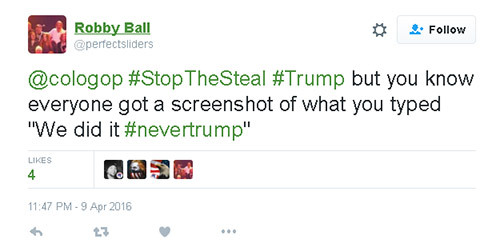 #NeverTrump." Within minutes, the tweet was deleted. But not before the damage was done. Steve House, the Colorado GOP chairman, insisted to the media that his staff had absolutely nothing to do with the tweet. "There's no way we tweeted that," House said, according to a Politico report published yesterday, although he acknowledged that the state party was responsible for deleting the post. Though the tweet was live for only a matter of minutes, the repercussions of it were immediate and lasting. Twitter users and media sources alike began to lambast the supposedly neutral arbiter of Saturday's delegate selection process for being quietly biased against Donald Trump. 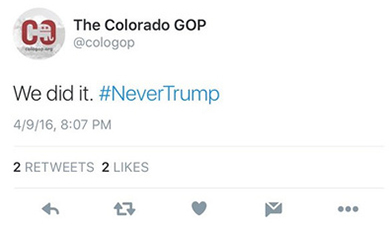 Several sources for the Colorado GOP Party told Politico that the tweet was the work of two young Republicans at D/CO, a right-leaning consulting firm that caters to millennials. 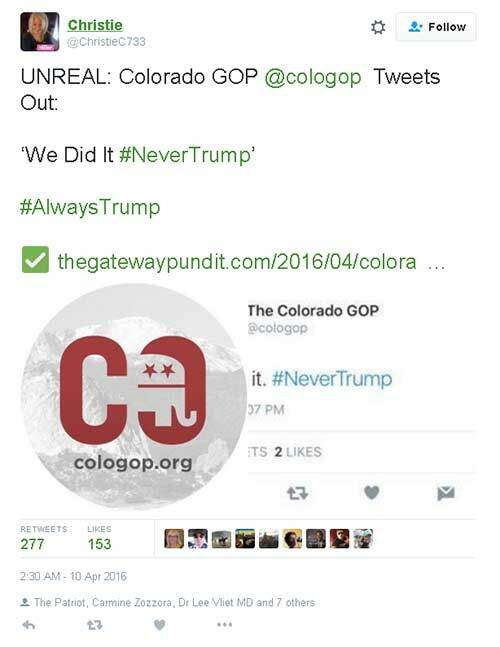 "Caleb Bonham and Kyle Forti, who formed D/CO in December, just took over a number of clients from another local firm, Avinova, which used to assist the Colorado GOP with social media," reported Politico. Do you think the Colorado primary was rigged? Tell us your thoughts on Twitter @moneymorning, or like us on Facebook. message for Colorado's insiders SHAME on you for taking away THE PEOPLES VOTE " you will know them by their fruits " matt. 7:15 . Obviously electing to ignore both the wishes of Republican party members and also the "majority". In such new circumstances the selected delegates for Colorado should be free to vote for who they wish. Quite an undemocratic process.